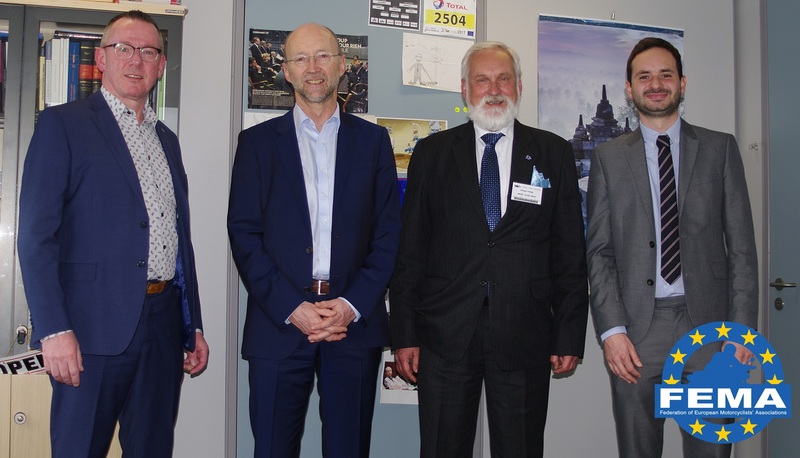 The FEMA team had another constructive meeting with officials from the European Commission, to discuss our joint efforts to improve road safety for motorcyclists. For FEMA it is very important to talk to the European Commission about the special place motorcyclists and other users of powered two-wheelers have in everyday traffic and the special place they should have in the implementation of Intelligent Transport Systems (ITS) that could potentially make traffic safer. FEMA constantly calls for the needs of motorcyclists to be taken into account during the design, development and implementation of ITS systems, to ensure that motorcycles are not excluded. The European Commission is willing to cooperate with us and seems to understand our concerns about the possible negative effects if certain advanced driver-assistance systems (ADAS) developed for cars were simply to be copied onto motorcycles. By having regular meetings with officials from the European Commission, FEMA is able to represent the European riders and to make sure the voice of all our member organizations is heard in Brussels. To read more about the European Commission’s road safety ambitions, click here.